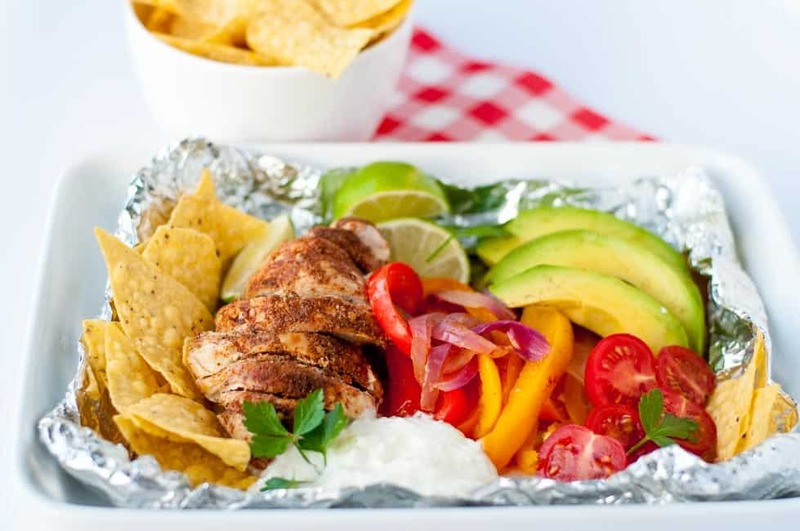 Relax and enjoy summer weather with these easy make-ahead meals of juicy chicken fajitas in foil packets. Chicken Fajitas! 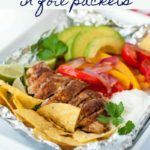 We all love them, and now these Chicken Fajitas in foil packets make it easy to enjoy them more often. Grilling season is here! It’s time for cook-outs, camp-outs, deck and barbecue parties with friends. It’s also time to simply enjoy easy-to prepare meals with your family around a picnic table. Hot dogs and hamburgers: step aside! 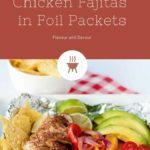 These Chicken Fajitas in foil packets are an ideal way to serve a nutritious meal to your family and get in the swing of easy summer living at the same time. Here’s a bonus. 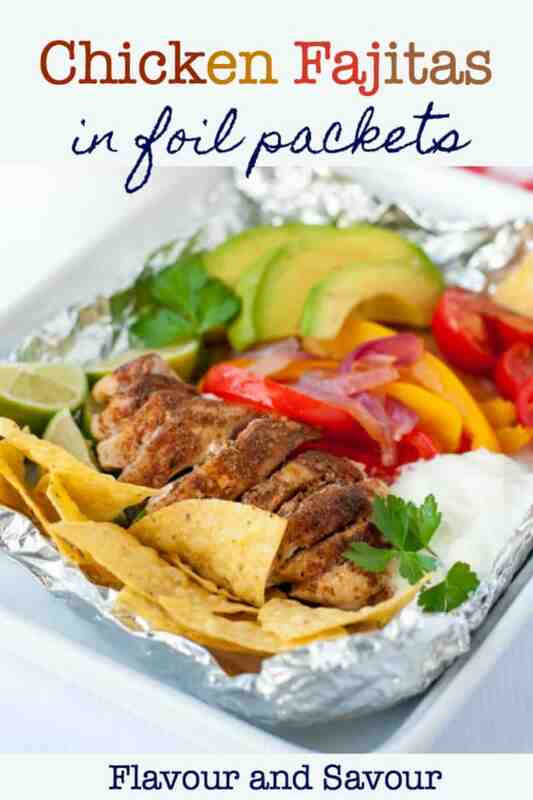 These foil packs can be made ahead of time and refrigerated until you’re ready to put them on the grill. 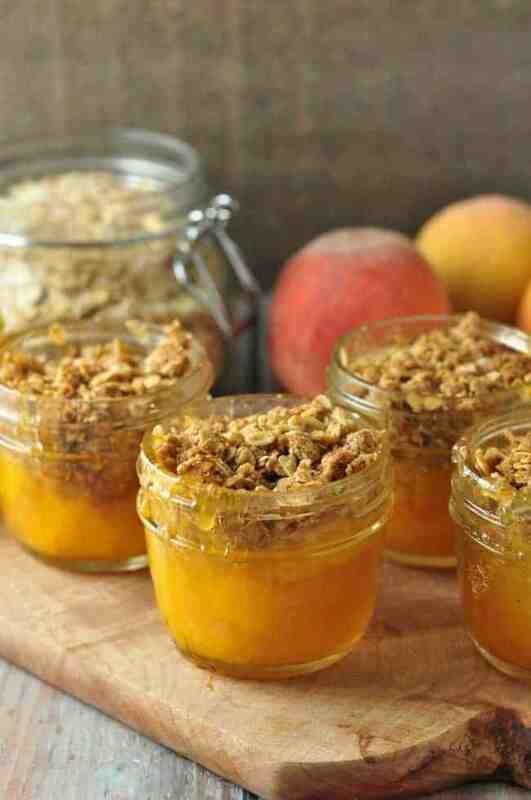 I’m planning to make these for our summer boat camping trips. With dinner prepared and packed up in neat and tidy foil packets, we’ll have time to enjoy being outdoors instead of spending time making meals. First, slice bell peppers (one red, one orange and one yellow) and red onions. Next, slice boneless, skinless chicken breasts and sprinkle with homemade taco seasoning mix. Arrange with peppers and onions on a square of heavy-duty foil (lined with parchment paper if you don’t like your food touching foil). Drizzle with a little extra-virgin olive oil, sprinkle the peppers with a little smoked paprika if you like, add a squeeze of lime juice and wrap them up! Fold foil loosely over chicken securing ends, but allow a little space for heat to circulate. Refrigerate until ready to grill. 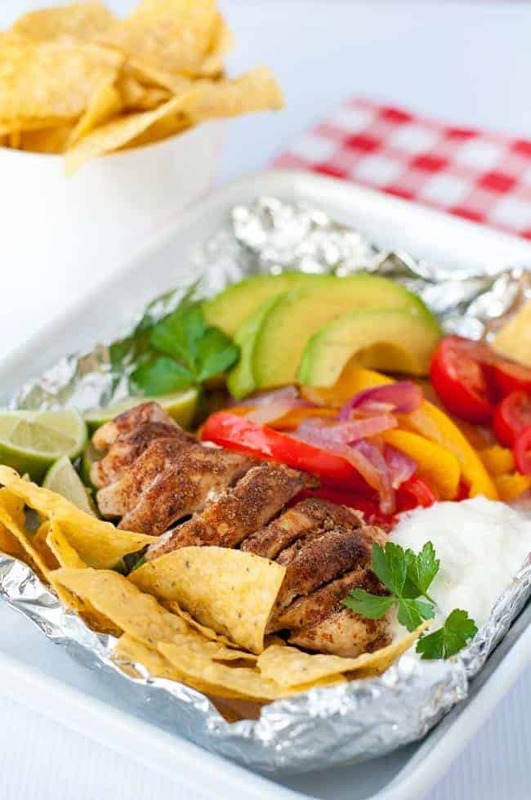 Cook the packets on the grill (they’ll only take 20 – 25 minutes), open them and load them up with all your favourite fajita fixings — tomatoes, avocados or guacamole, sour cream, fresh pico de gallo and cilantro. Pass the forks, serve with plenty of tortilla chips and dig in! 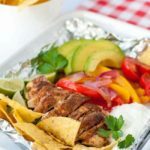 Relax and enjoy summer weather with these easy make-ahead meals of juicy chicken fajitas in foil packets. Grill, then load them up with your favourite fajita fixings! Cut four squares of heavy-duty aluminum foil, about 16 inches square. Slice chicken breasts crosswise into thin strips. Sprinkle each with up to 1 tablespoon of taco seasoning mix. Place one breast on each of the foil/parchment paper squares. 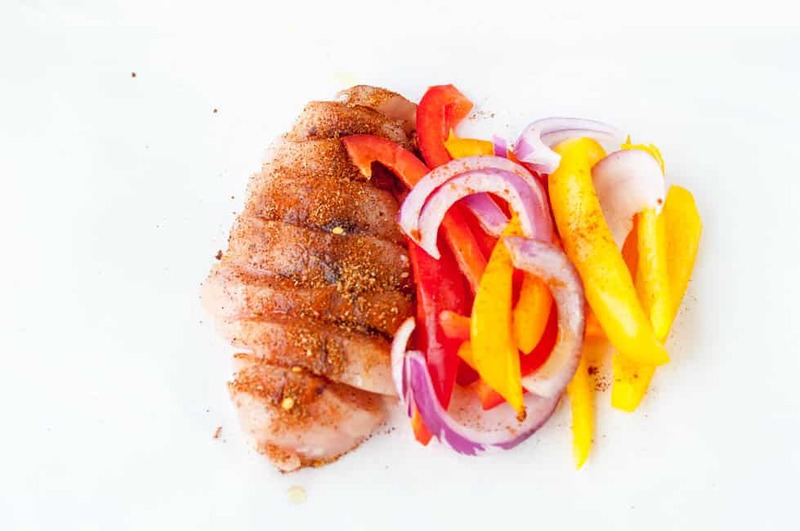 Divide peppers and onions evenly and arrange beside each of the chicken breasts. Sprinkle the peppers with 1/4 teaspoon smoked paprika, if desired. Drizzle the chicken and peppers with 1 teaspoon olive oil. Squeeze a little lime juice on each. Fold foil loosely over chicken securing ends, but allowing a little space for heat to circulate. Refrigerate until ready to grill. Grill over medium heat, checking for doneness after 20 minutes. Garnish with cilantro and serve with sliced avocados (or homemade guacamole), pico de gallo, cherry tomatoes, sour cream, and tortilla chips. 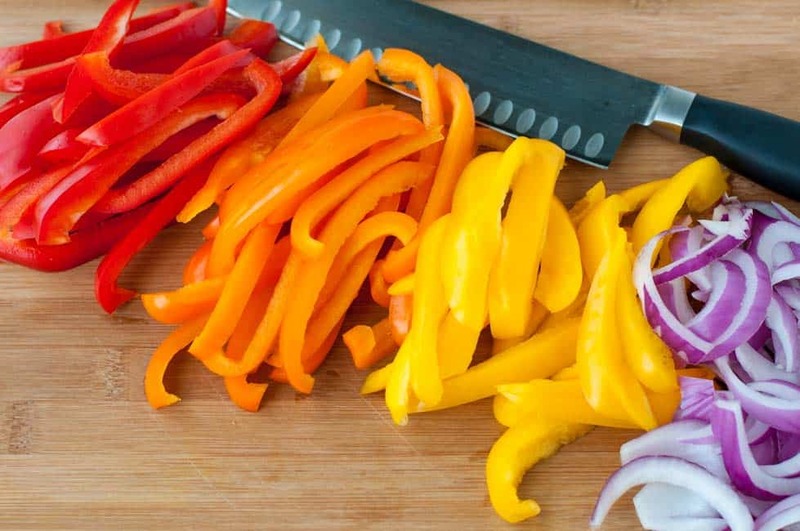 If you cut the chicken breasts, peppers and onions in bite-sized pieces, you won't need a knife and it makes it easy to eat straight from the packet. 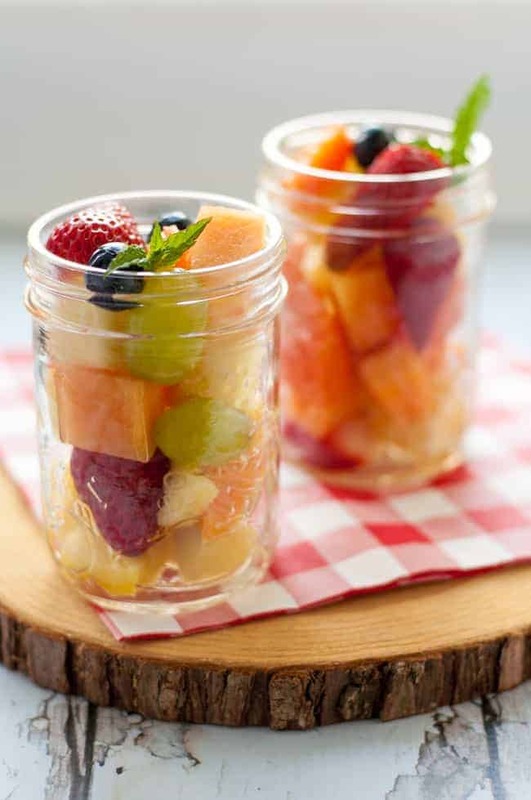 More make-ahead ideas for camping or your next picnic! I’m such a huge fan of foil packets!! When I worked out west and we didn’t have kitchens to cook in, I relied heavily on these kinds of meals. Had I known I could get creative and make fajita packets I would have done so alot earlier. These look fantastic Elaine! Thanks Taylor! I have a lot more combinations that I’m anxious to create and try. What a great idea for summer camping and backyard entertaining! I am so late to the game with foil packets for summer. I love it! These look great and we all love fajitas in our house. Great for summer entertaining and even camping. Thanks, Julia! I’m making these to take out on our boat next week. These look delicious! I love how quick and ease they are. Not to mention how great it is that each foil package can be personalized; perfect for family dinners! We just took it with us on our last camping trip and cooked it on our small barbecue. Worked great! Thanks for commenting!